Amsterdam, NL – The old-fashioned paternalistic relationship between doctors and patients has gradually evolved into a more collaborative one in the era of patient-centered medicine. Shared decision-making (SDM), in which doctors and patients jointly decide on treatment or care, has emerged as a gold standard model of healthcare. Yet considerably less attention has been given to obtaining the patient’s perspective on neuromuscular research on such matters as research objectives, study design, or even consent. A position paper in the Journal of Neuromuscular Diseases describes conclusions reached at an international workshop that focused on finding creative solutions to integrate and enhance the patient's point of view in neuromuscular research. “I need to revise my grant application to include patient perspective in my research project!” commented attendee Valeria Sansone, MD, Director of the NEMO Centre, Milan (Italy). Dr. Sansone was one of 45 clinicians, healthcare professionals, researchers, patients, caregivers, and representatives from regulatory agencies and pharmaceutical companies from 15 countries who attended this international workshop. The gathering was convened by the European Neuromuscular Centre (ENMC) upon its 25th anniversary and was held in Milan, Italy from January 19–20, 2018. 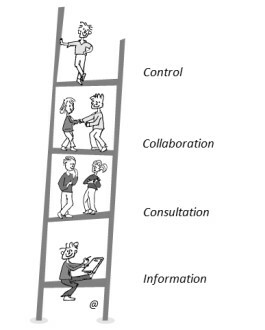 The ladder of participation. By Dr. Anna Ambrosini, adapted from: de Wit MP, Kvien TK, Gossec L. Patient participation as an integral part of patient-reported outcomes development ensures the representation of the patient voice: a case study from the field of rheumatology. RMD Open. 2015;1(1):e000129. During the session on biobanks and registries, Hanns Lochműller of the CHEO Research Institute in Ontario (Canada) said, “Rare disease research centers offer an ideal setup to implement and integrate patient involvement at all levels.” He pointed to several examples of patient co-creation in research programs such as the UK myotonic dystrophy registry, which is patient driven but professionally supported. In this registry, the patient initiates the registration and names a doctor to enter the patient’s clinical data, eliminating possible biases of past registries. Patients have also played a significant role in the TREAT-NMD global registries and developing the International Charter of principles for sharing bio-specimens and data. “Patient commitment is facilitated when registries and researchers commit to reporting research results back to the data providers, the patients, and families. A challenge is educating scientists to be flexible and change their research protocols according to the priorities of the research participants,” explained Dr. Lochmüller, co-Editor-in-Chief of the Journal of Neuromuscular Diseases. Patient input may come from individual patients or patient organizations, such as EURORDIS and those that are condition-specific. Several initiatives are in place to help patients achieve relevant competencies and encourage those who want to take on the responsibilities of being knowledgeable patient representatives. “Having the patient voice in a clinical trial is not only feasible, it should be a logical and natural thing,” commented Dr. Lochmüller. Full openly available study: “The Position of Neuromuscular Patients in Shared Decision Making: Report from the 235th ENMC Workshop: Milan, Italy, January 19-20, 2018” by Hanns Lochmüller, Anna Ambrosini, Baziel van Engelen, Mats Hansson, Aad Tibben, Alexandra Breukel, Ellen Sterrenburg, Guus Schrijvers, Ingeborg Meijer, George Padberg, Holly Peay, Lucia Monaco, Mike Snape, Anne Lennox, Elena Mazzone, Nathalie Bere, Mencia de Lemus, Erik Landfeldt, and Raffaella Willmann on behalf of the 235th ENMC workshop study group (DOI 10.3233/JND-180368), published in the Journal of Neuromuscular Diseases, Volume 6, Issue 1 (February 2019) by IOS Press. The article is openly available at content.iospress.com/articles/journal-of-neuromuscular-diseases/jnd180368. For additional information, contact Diana Murray, IOS Press (+1 718-640-5678 or d.murray@iospress.com). Journalists who wish to interview the authors should contact Hanns Lochmüller (+1 613-737- 8899 ext 78917 or hlochmuller@toh.ca). The 235th ENMC Workshop was made possible thanks to the financial support of the European Neuromuscular Centre (ENMC) and ENMC main sponsors: Association Française contre les Myopathies (France), Deutsche Gesellschaft für Muskelkranke (Germany), Muscular Dystrophy UK (UK), Muskelsvindfonden (Denmark), Prinses Beatrix Spierfonds (the Netherlands), Schweizerische Stiftung für die Erforschung der Muskelkrankheiten (Switzerland), Telethon Foundation (Italy), Spierziekten Nederland (the Netherlands), and the Finnish Neuromuscular Association (Finland). Audentes Therapeutics supported travel costs from non-ENMC member countries.